The Chinese name for and images of the plump, cute cartoon character are being blocked on social media sites here because bloggers have been comparing him to China's president. When Xi Jinping and Japan's Prime Minister Shinzo Abe endured one of the more awkward handshakes in history netizens responded with Winnie the Pooh and Eeyore shaking hands. And then there was the time President Xi popped his head out of the roof of his special Red Flag limousine to inspect the troops - a photo appeared online of a toy Winnie the Pooh popping out of his own little car. It is not only that China's censors will not tolerate ridicule of the country's leader, they do not want this beloved children's character becoming a kind of online euphemism for the Communist Party's general secretary. Here the president is Mr Grey. He doesn't do silly things; he has no quirky elements; he makes no mistakes and that is why he is above the population and unable to be questioned. The previous Chinese Leader Hu Jintao had a catchphrase of "promoting a harmonious society" or, in Chinese, hexie 和谐. Bloggers started to refer to being censored as having been "harmonised" - bei hexie le 被和谐了 - but, by changing the tones in Chinese or changing the characters, you can fudge the meaning. So another hexie is river crab 河蟹。In other words, when you see an image of a river crab on the internet in China, it is likely to be a reference to something having been censored. Another Chinese leader Jiang Zemin came up with a political theory called Three Represents, san ge daibiao 三个代表。If you switch that around a bit it becomes dai san ge biao 带三个表, or wear three watches. So the wearing of three watches became a cheeky way of referring to his contribution to China's socialism "with Chinese characteristics". It is not necessarily easy to get around China's censors though. For example they have been extremely successful at virtually wiping out the existence of the country's number one dissident Liu Xiaobo - the winner of the Nobel Peace Prize who died in custody here last week - at least as far as the general public goes. Most Chinese citizens have simply never heard of him. If you have anything to do with China at all here is a way of testing the censorship regime for yourself. Everybody in China uses the Wechat (Weixin 微信) App… and I do mean pretty much everybody. Sit down next to a friend who also has Wechat on their phone. Now try and send them a text message using the name "Liu Xiaobo". Wechat is a privately owned company but China's tech giants must toe the Party line. 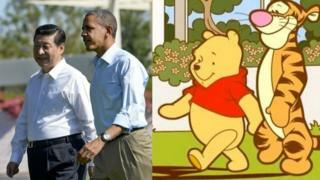 Winnie the Pooh has actually fallen foul of the authorities here before. This renewed push against online Pooh is because we are now in the run-up to the Communist Party Congress this autumn. The meeting takes place every five years and, amongst other things, sees the appointment of the new Politburo Standing Committee: the now seven-member group at the top of the Chinese political system. Xi Jinping will also be using the Congress, which marks the beginning of his second term in office, to further solidify his grip on power by promoting allies and sidelining those seen as a threat. It had been thought that China has transformed into a system of two-term governance for the country's supreme leader but this is merely a recent convention rather than a rule. So, because President Xi has made so many enemies within the Party as a result of his widespread anti-corruption crackdown, many have questioned whether he can afford to give up power after the next five-year term. In order to stay on he will believe that he needs to ensure there are no cracks in the absolute loyalty he demands. And, in this climate, there is seen to be no room for even the most frivolous challenges to his supreme authority.